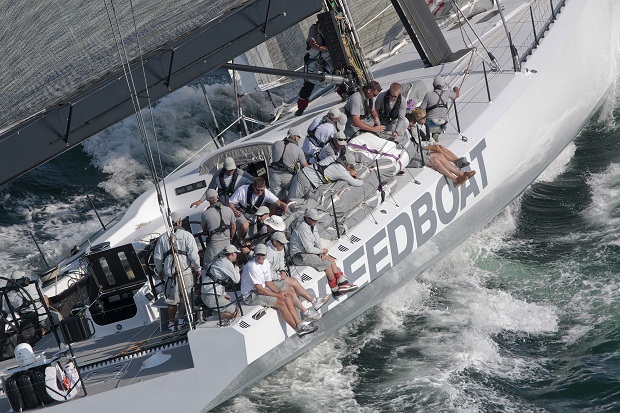 Finishing second at 6:25 was Il Mostro (Puma), a 70-foot Volvo Ocean Race boat sailed by Kenny Read, whose brother, Brad, was in Speedboat’s afterguard. Boat boats sailed in the Open Division for racing yachts with canting keels. At 6am Bermuda time the mini-maxi Rán on its blog reported less than 10 knots as she beat to windward toward the buoys guarding Bermuda’s reef. “Titan is downwind from us and is not a threat. Rambler and Beau Geste are upwind and in front as we thought they would. We are still in a strong position although it now looks like Beau Geste is the biggest threat. Just a few more hours to go.” The blog reported, “As we are approaching the finish slowly but surely, we are all on deck, no more watches, all are on duty for the final stretch. Coffee and tea served on the rail – black only as no more milk powder onboard. Very calm water. 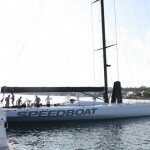 Wind speed of 9 knots – just over – and land in sight.” The iBoattrack showed the rest of the 183-boat fleet, some as small as 33 feet in length, stretched back to the Gulf Stream.